Lamm ML3 Signature single-ended triode power amplifiers. Rest of system: Wilson Audio MAXX series 3 speakers, NeoDio NR Two transport and NR Two DAC, Clearaudio: Innovation turntable, Universal tonearm with Titanium cartridge, Critical Mass Systems racks and stands, Kubala-Sosna Emotion interconnect and speaker cables. …Finally, I come to the best sound I heard at the CES, THE Show or anywhere in Las Vegas, and my pick will probably come as no surprise to those who read my reviews and know the equipment I admire — and use. After he arrived in Las Vegas, Vladimir Lamm found out that he was bumped from the demo room he booked months before. But that didn’t deter him, or the gang from Wilson Audio, who set up a pair of MAXX Series 3 speakers in the new room, which had a completely different layout. A smallish alcove was the only suitable space for the speakers and Lamm ML3 Signature amps. Other products in use were a Lamm L2 preamp and LP2 Deluxe phono stage, a NeoDio NR Two CD transport and NR Two digital-to-analog converter, and a Clearaudio Innovation turntable with the company’s Universal tonearm and Titanium cartridge. Cables were from Kubala-Sosna’s Emotion line, with Critical Mass equipment racks and platforms providing support for the electronics. Best of Show: Lamm ML3 Signature amps and Wilson Audio MAXX 3 speakers. This system had it all, although you had to get the sound of so many other systems out of your ears to appreciate it fully. There was the acute resolution for which Wilson Audio speakers are known, along with tonal purity, low-end drive, and a vivid presence throughout the midrange and into the bass. While other systems reproduced, this one engaged and enthralled. I played a number of cuts from my CD-R here. I would have liked to listen to the entire disc. I have the same speakers and amplifiers in my listening room right now, though they’ll do me no good until I get some antibiotics to clear up my hearing. Here’s an early wish for a sickness-free — and less frenzied — CES 2010. Lamm was driving the new Wilson Maxx series 3 with its 32Wpc ML3 Signature SE triode monoblocks ($139,290/pair). It was my first chance to hear either, so I can’t tell you if it was the speakers or the amps that were making the magic happen, but happen it did. No need to state the obvious—that’s a stratospheric price tag. And I’m not sure that if I could easily afford it, I could actually write a six-digit check—much less one for the whole system, wires and all—but I can’t argue with the results. The Lamm/Wilson combo was among the top five musical experiences of the show—and one that demonstrated that, as good as really good high-end audio is, there are some obsessed builders out there that are operating on an entirely different plane. I can wish my system sounded this good, but it doesn’t. Sigh. The Magico M5. With the Wilson MAXX Series 3 (in both the Boulder and Lamm rooms) coming in second, and the Vandersteen Model 7, the Da Vinci Virtù, and the Perfect8 Technologies The Source tied for third. This said, there really wasn’t a loser at this CES. Four-way tie: Kimber Isomike demo; TAD Home Audio room featuring the CR-1 monitor; Analysis Audio’s Omega ribbon speaker driven by the Spectron Musician amp; the LAMM Industries room. In my book, the LAMM Industries’ ML3 Signature SET still reigns supreme. Its 32 Wpc power output is a testimonial to the concept that not all watts are created equal. Driving the Wilson Audio MAXX Series 3 loudspeakers it produced some of the best sound at the show with simply gorgeous harmonic textures. Bass control was firm to a degree I had not previously experienced with SET amplification. For the record, the rest of the chain I auditioned consisted of the NeoDio NR Two transport and DAC, Critical Mass Systems racks and stands, and Kubala-Sosna Emotion interconnect and speakers cables. We come now to a truly magnificent system: the Wilson Maxx Series 3s driven by $140K Lamm Industries ML3 amplifiers. There was a lot of gorgeous sound at this year’s CES, but this room was the most gorgeous. Incredibly dense in tone color and texture, magnificent in low-level resolution and dynamic scale, voluminous in soundstaging, it was so exquisite (and so realistic) that it simply disarmed criticism. I listened to Crash Test Dummies’ terrific “Superman’s Song” and Shawn Colvin’s cover of “Seven-Year Ache” with my mouth open…the sonics were that ravinshingly beautiful. If I had any criticism, it might have been that the sound was simply too beautiful — though very very realistic, nonetheless. But I kinda doubt whether “too beautiful” will bother any of you guys. Lamm ML3 Signature single-ended triode power amplifiers, Lamm ML2.1 single-ended triode power amplifiers, Lamm L2 Reference preamplifier, Lamm LP2 phono preamplifier, Wilson Audio MAXX series 3 speakers, NeoDio NR Two transport and NR Two DAC, Clearaudio Innovation turntable, Universal tonearm with Titanium cartridge, Critical Mass Systems racks and stands, and Kubala-Sosna Emotion interconnect and speaker cables. 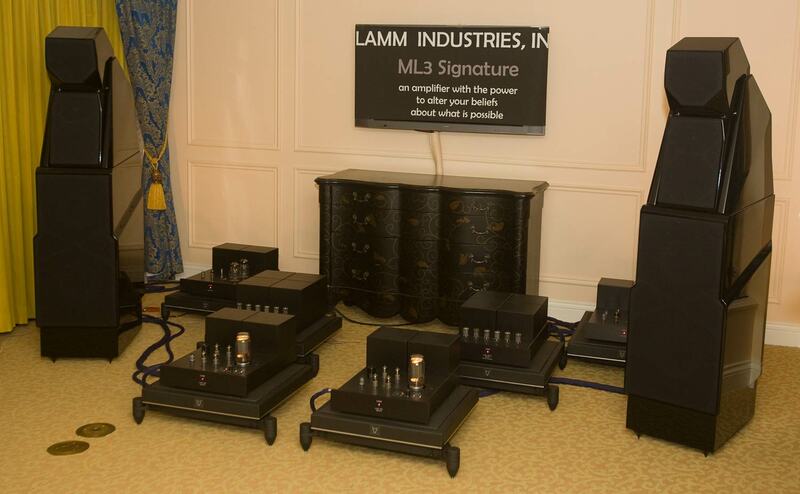 Lamm Industries ML3 Signature SE triode monoblock amplifiers on Critical Mass stands. Entering the Lamm Industries room is like entering a cloister; a solemn event. It was the only room at CES in which I regretted not wearing a tie. The sign on the wall between the Wilson Maxx Series 3 loudspeakers at the far end read: an amplifier with the power to alter your beliefs about what is possible. They were talking about the ML3, a 32 watt per channel, four chassis tube amplifier that has received critical acclaim over the past year. The L2 preamplifier and LP2 phono preamplifier had supporting roles as well. A NeoDio Transport and DAC and a Clearaudio Innovation turntable with Universal tonearm and titanium cartridge held down the front end. Critical Mass Systems racks and Kubala-Sosna Emotion cables kept the vibrations controlled and the equipment connected. Except for the Maxx 3 loudspeakers, it was a rig not unlike what was presented at Montreal . The room here was smaller, however, and that prevented a lot of moving around. I had to stand at the back. Mostly people just kind of listened reverently to classical and easy jazz. Vladimir Lamm would kneel down and softly converse with aficionados from time to time. There was a flyer for the NeoDio NR 22 CD player which may have been in the rig rather than the separate transport and DAC. It uses multiple reading and playback from memory buffering, a technological approach first developed by Mark Porzilli with his Memory Player some years ago. The NR 22 is laden with damping technology and attention is paid to eliminating magnetic coupling on the back panel. It upsamples to 24-bit/192kHz. The music here was very well reproduced, and I certainly respect the man who is the brand, but were my beliefs altered? I’d have to slide into that room late at night, slip in a disc with Eric Clapton and BB King and let them mix it up with a little “3 o’Clock Blues” to answer that question. Maybe in Montreal …and I’ll be sure to wear my Jerry Garcia tie. I may as well keep gushing about this room, as I’ve already complimented the NeoDio digital source. Lamm, known for its exquisite amps, showed the ML3 Signature and ML 2.1 mono amps with Kubala Sosna cabling to the Wilson Maxx Series 3; this combination and set up was stunning! I have heard the Wilson products before on several occasions and their form was as good as I have heard from them. There was no slouching, no second-class about this rig. The monotone black color of the amps and speaker evoke from me an oxymoron, “austere decadence” – no frills, just serious opulence. One of my favorite sounds at the show. It is never easy to evaluate amplifiers in the context of unfamiliar speakers. That said, the Wilson Maxx’s sounded better driven by the Lamm ML3’s than I have ever heard them. Indeed, as a friend remarked a few years ago, systems with Lamm amplifiers invariably sound good, suggesting that the amplifiers must be doing something right. Crazy expensive, but at least they deliver the goods. A system to recalibrate your ears after a long show of sonic bumps, loop-de-loops, hairpin turns, hair-raizing, hair losing near escapes and potholes.